Upon my initial watching of Everest​, I found the first 25 minutes fairly boring. However, after watching the film a second time I was more interested and invested in the characters, which made me pay closer attention. For some, Mount Everest is the pinnacle (pun intended) of extreme outdoorsmanship. The highest peak in the world, hundreds of people gather at its base each year in an attempt to reach the top, over 29,000 feet above sea level. Along the way, any number of things can go wrong resulting in fatalities. The 2015 movie, Everest, retells one of these awful times in its history. Coming to Blu-ray, Blu-ray 3D and DVD this week, it recaps the 1996 climb that led to 8 climbers deaths. Robert "Rob" Hall (Jason Clarke; Terminator Genisys) was a successful guide who had taken amateur climbers to the top of Mount Everest for 4 years, and 1996 was no different. The climb started 40 days prior to their May 10th ascent to the summit with training and body preparedness. Then, early on the morning of May 10th, they started out on a beautiful day's climb and most successfully made it to the top after minor delays. However, what they didn't know was a deadly storm was about to hit the peak, stranding some in the barren, frozen, unforgiving tundra. Hall, fellow guide Scott Fischer (Jake Gyllenhaal; Brokeback Mountain) and six others died that day. Based on the real life story, Everest is a testament as to just how unforgiving Mother Nature can be. I have to say that upon my initial watching of the film, I found the first 25 minutes fairly boring. However, after watching the film a second time I was more interested and invested in the characters, which made me pay closer attention. I can also say that knowing this was a true story made the ending all the more heartbreaking. The Blu-ray offers spectacular footage of the mountain and the scenery and the 1080p High Definition video is crisp and vibrant, especially showcasing the various colors as the cast travel through the cities of Nepal. The Dolby ATMOS audio was a real treat, as unforgiving weather and avalanches attack your ears from all angles. The best experience was the 3D Blu-ray version of the film as every little detail popped off the screen and enveloped you into the landscape of Mount Everest. The extras were also quite interesting, including a "Making of" feature and Learning to Climb, a sort of boot camp for the actors to learn the art of climbing a snowy mountain. However, the best but most heartbreaking extra was the look at the real life climbers who died as told by their loved ones. While Everest was a good film with a fairly good cast, I can't imagine watching it over and over again. The script got into too many technical details of the climb, and I found certain scenes confusing (not being able to differentiate between who was still climbing up the mountain and who was on their way back down). Personally, I think I would rather watch the 1998 documentary of the same name that dealt with the real life events of that 1996 fatal climb. Download Everest from the iTunes Store in Digial HD. 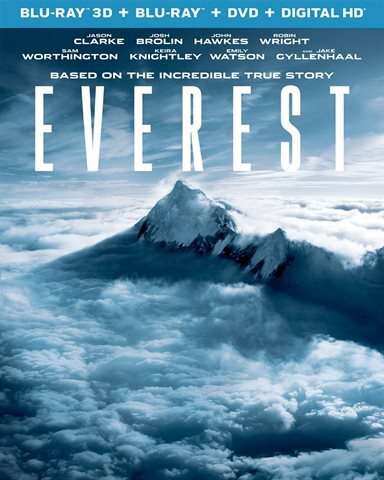 For more information about Everest visit the FlickDirect Movie Database.